Seventeen plus one. The legal voting age. The age hubs was when we got married. The number of years that hubs and I have been married. We were just kids when we tied the knot. What did we know? I read so many anniversary posts with declarations of perfect affection for a perfect spouse and perfect relationship. Well, I suppose I'm more of a realist. I love my hubs. Don't get me wrong. But our eighteen years together have certainly been anything but perfect. Long deployments. Heartaches. Disappointments. Stress. Trials. But there have also been beautiful moments. Moments of joy. Moments of happiness and laughter. Moments that can be enjoyed and appreciated only after one has endured those less than stellar days. Last year I shared the ups and downs of our 17 years together with one event for every year. You can read that here. We have both evolved. We are different people today than we were on that cold morning in November 18 years ago. But we have grown and changed together. We have defied a slew of statistics stacked against us. And we are still here. Hubs is a great person. Selfless. Thoughtful. Likable. Generous. Trustworthy. Handy. Industrious. Domesticated. Boring. Average. Imperfect. Messy. Beautiful. And mine. Happy 18, babe. Thanks for sharing this perfectly imperfect life with me. Wow, that's just beautiful! I love that quote in the end. I think what scares me the most about finding Mr. Right now is if he'll be Mr. Right for the rest of my life? That's a LONG time and one can never tell how different of a person you'll be 5, 10 15, or more years from now? Marriages like yours give me hope that loving relationships can last forever. Happy Anniversary to you and your hubby! I can't believe it's been 18 years!!?? Congratulations! How sweet! What beautiful words. Congrats! 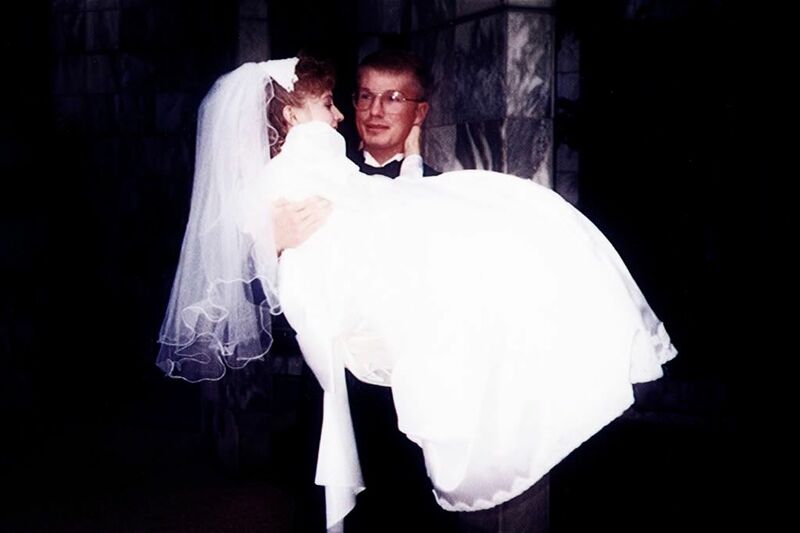 I was 18 too when we got married - and oh how I wish we'd had a professional photographer now too! I thought your photos look amazing!! Happy Anniversary. Happy anniversary! I love the quote. I know it perfectly describes my husband an I.
Congrats on your 18 yrs! Getting married young, what do any of us know? LOL Here's to another 18+ years! Very real, very true, and wonderfully accepting. Happy anniversary to you both :) Chad and I celebrated 17 years in July. I'm adding your quote to my collection. Congrats! Eighteen years is quite an accomplishment! I wish you both another "Boring. Average. Imperfect. Messy. and Beautiful." 18 years. This is beautiful. I haven't been married quite as long as you have, but I can relate to the "Boring. Average. Imperfect. Messy, and Beautiful." description. It's not all shiny and perfect, but how unexciting would THAT be? Happy Anniversary! I love the photo collage - your kids have some talent! That's real life, Lish and that sounds like real love to me. Congrats on your 18 years! Loved this!!! What an awesome post to write. So true and sincere. Have a great Anniversary! Happy Anniversary. I remember putting together your bridal shower in Cedar Rapids. My first bridal shower! Happy 18 years and many more to come. Happy Anniversary! Such A beautiful post! I can relate to your whole post, My hubby and I are at #14. Happy Anniversary!!!! Glad the kiddos got the pic of you recreating your original wedding photo. I love it!! Happy Anniversary to you both. You make such a sweet couple. Eighteen years is definitely something to be proud of! PS I'm loving those bangs on you. Super cute! perfect is in the eye of the beholder :) my marriage is perfect and so is the hubby- perfect for US. perfect for ME. not necessarily anyone else description of the word- or even close to it. Happy Anniversay! 18 year´s is a loooong time! (18 year´s ago I had just left Temple Square.) I hope you had a wonderful day. I love the photo´s your kids took of you and your husband. You are a beautiful couple! Awww! Those are great photos, by the way. You married young and you made it. Now that's real love. Happy Anniversary! Love this post. So real. Love the pictures too. Shows your real life. Thanks for sharing! Congratulations! The photos and post are beautiful. Happy anniversary! This was such a sweet, and REAL post...which is why I love ya! March will be our 18th as well. although we tied the night a good eight years older and wiser, than you two. I doubt if it makes much difference in the end. When you find the right one, you need to make your move ; ) If you don't have any valleys you won't be appreciate the views when you climb to the top of the mountain. Congrats on your journey... one day at a time. Love you guys. Happy Anniversary! Congratulations on 18 years together.